As the festive (party) season approaches nothing is more glamorous than BOLD red lips. It oozes confidence and sophistication and works a treat with the rich dark colours in clothing. To achieve the perfect finish, your lips must be hydrated. Firstly moisturise your lips with a primer, apply foundation over the edges of the lips followed by a lip liner to outline the lips, this will prevent the colour bleeding. 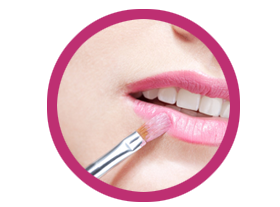 Apply lip colour with a brush, blot your lips with a tissue to remove excess colour, then reapply another layer of colour. Make sure the lipstick is matte to keep on trend for 2013/14. Team the strong lip colour with a simple eye make up and a hint of blusher across the cheekbones. And Wow You have the prefect look for Christmas and the New Year Celebrations! Next week we have some Helpful Beauty Tips on The Smokey Eye Look which is really fashionable this year. Please feel free to contact us for a Make Up Consultation, our opening hours are on our Contact Page.